Choosing to follow God means we’re walking in harmony with Him. And that means we’ll be walking out-of-step with this world and with “the god of this world,” as Yahweh’s adversary is called (2 Cor. 4:4). 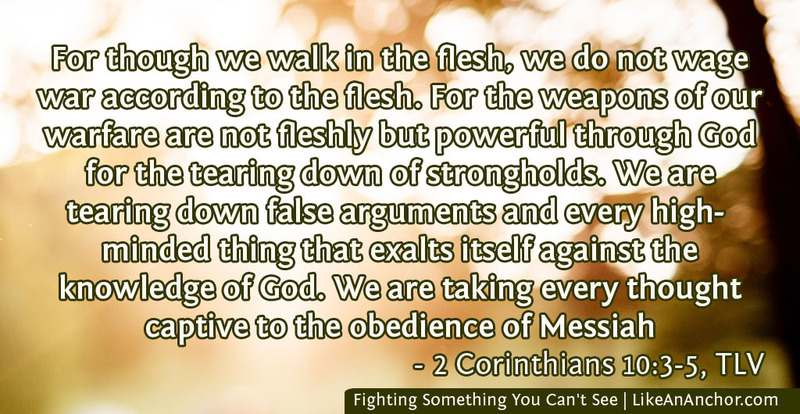 In many ways, our Christian walk is one of warfare and struggle. One of my ongoing struggles is with anxiety. My mind wants to loop through worst-case scenarios and imagine all the “what if?”s in a given situation. I’m often nervous, jumpy, and preoccupied with what’s going on in my head. My anxieties are something I can’t see, and unless I tell people about them or have a panic attack in public most wouldn’t have a clue how much it impacts my life (they call this “high functioning anxiety”). Scriptures tell us that as Christians, the battles we face have spiritual components. These sorts of battles are difficult whether they’re visible to other people or not; whether they’re internal or external. 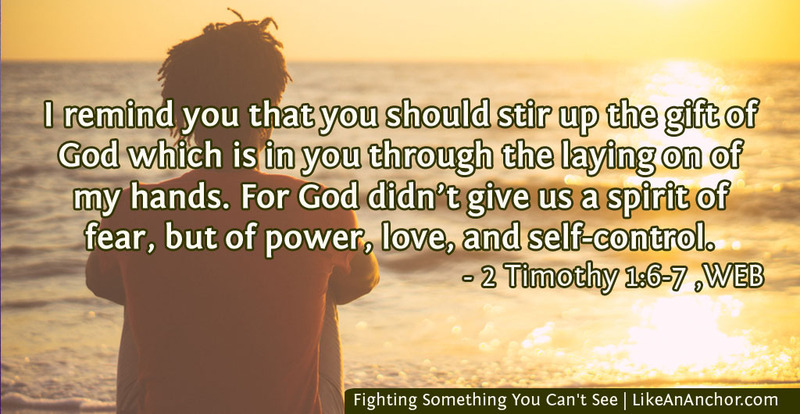 But even when we feel like we’re battling something we can see — a nasty coworker, a disease, a failing relationship — Paul reminds us that we “do not wrestle with flesh and blood.” There are spiritual forces behind all the battles we face (Eph. 6:12). And we can’t see the full extent of our battles, or fight them effectively, without God’s help. It’s often a struggle for me to answer the question, “How’ve you been?” or “How was your week?” Unless something electronic breaks or someone I care about is going through something, my weeks would usually look pretty good from the outside. And I don’t want to tell most people that I’ve been struggling all week with something that’s only a problem inside my own head. There’s a stigma against admitting you’re struggling. You might be seen as a saintly example of endurance if you’re facing a physical trial. But in many churches it’s a different story when you’re battling something mental or emotional. So many people see interior struggles as either a lack of faith or something that you could just “get over” if you prayed about it enough. However, there’s a passage in 2 Corinthians where Paul makes it sound like struggles within ourselves are the kinds of battles Christians usually face. Our warfare isn’t primarily a physical battle. It’s a spiritual and internal one that can also spill over into our outer lives. Even when the Adversary uses outside attacks it’s still part of a battle for our minds, hearts and spirits. It’s well past time for Christians to recognize this and start supporting each other through the invisible battles we all face. What Does It Mean To Be Strong In The Lord? One of the most important lessons from all that study is that God is more than prepared to help us fight. He provides armor to protect us so we can stand against attacks. He stands there with us as our strong helper, fighting right along side us and for us. He gives us weapons through study of His word and prayer that can overcome all types of adversaries. He’s not going to give you a battle to fight without offering everything you need to win. We just have to ask for His help. The word translated “worries” here also means “cares” or “anxieties.” It’s merimna (G3308), which comes from a word meaning “to divide” or “distract” (G3307). When we have anxious thoughts they divide our minds, drawing our attention off good things and distracting us with worries. It’s so hard for me to turn anxiety over to God. In a way, letting go of the thoughts demanding constant attention doesn’t seem safe. But maybe if I thought about it less as “things I need to worry about” and more as a battle I need to let God help me fight, then it might be easier to put my worries in God’s hands. God doesn’t want us to cower in the face of attacks inside our minds. He wants to help us fight back. Casting our anxieties on God frees us to let Him help us fight the real battle behind all the other struggles we face. 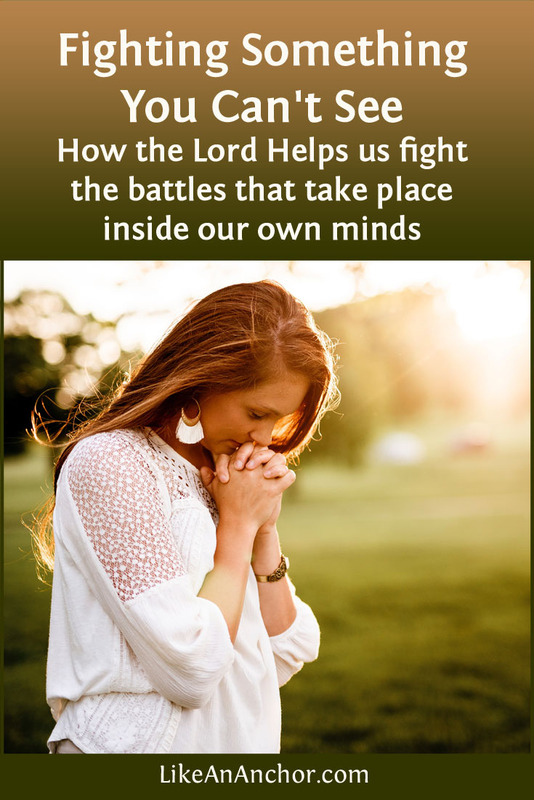 Fighting battles we can’t see requires a disciplined mind submitted to God. The spirit He gives us is not one of fear, “but of power, love, and self-control” (2 Tim. 1:7, WEB). When we’re walking in harmony with Him, He helps us face our battles and equips us to win. We can start following these instructions today. Praying and regulating our thoughts to focus on these things are a first step toward trading anxiety for peace. And it’s okay to start small. The Lord doesn’t expect us to conquer everything all at once. He just expects growth toward the goal and He’ll continue to help us fight as the old battles come back or new battles show up. Winning a battle inside your mind isn’t usually going to be a one-time thing. This is especially true if you’re battling an ongoing mental health issue or if you’re in a situation that keeps triggering something. But God will help you keep fighting and He can put peace in your heart even in the midst of your trials. You don’t have to be perfect or victorious before God starts helping you. You don’t have to feel bad or guilty or broken because you’re struggling. Just read the Psalms, or Job, or Jeremiah. God specializes in working with people who are fighting internal and external battles. It’s when we realize that we’re facing something that’s too much for us on our own that we can experience some of the most profound connections with God. Everyone needs Him. But it’s only those who recognize that need who can enter true relationship and fellowship with the Lord. No matter what type of battle you’re fighting, He’s ready and able to help all of us who will turn to Him and ask.